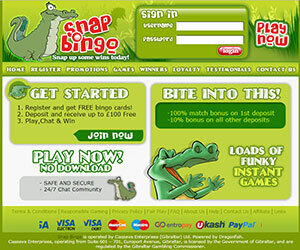 Snap Bingo | Get £10 Free + loads of bonuses! 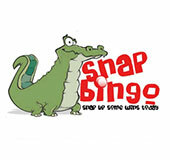 Sign up to the crocodile themed online bingo site with loads of fabulous promotions and games for you to snap up. With its green background and fun vibe you know that playing bingo on this site will bring you a lot of laughter and enjoyment and hopefully lots of cash. Lets start with their amazing welcome promotions; as soon as your register you will receive free bingo cards so you can start playing and see what games this site has in store for you. When you have used up your free bingo cards and hopefully won some cash why not make your first deposit and they will reward you with a 100% welcome bonus up to £100 and they also offer you a 50% bonus on all your reload deposits. 2. Click on the flashing play now to register and fill out your details. 3. Make your first deposit and receive a cool 100% Bingo Bonus and another 50% on all reloads. 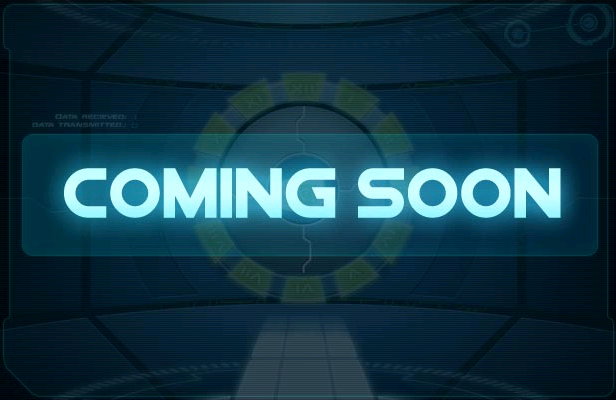 Once you sign up you will become part of their loyalty program and with that comes rewards and all the points that you will collect can be changed in to bingo cash. Everyday there is a £100 guaranteed jackpot to be won every single day and every Monday from 4-6pm there is a happy hour where you can play the chat games to win double points. Every month there is also 1 million loyalty points for you to collect just by starting a team and playing in the bingo tournaments- so why not bring your friends old and new and see what you can win. With every new friend that signs up to Snap Bingo you will receive 5,000 loyalty points. If you aren't having such a lucky streak with the Bingo one day why not take some time out and play some slots or instant games or maybe even casino games where you can still win cash and have lots of fun doing it. Snap bingo is happy to have a really friendly community and they want you to play and chat and make new friends and their chat hosts are on hand to play lots of games and make sure you are making the most of the site.